Mint tea, made by steeping green tea with mint leaves, is very popular, and many Moroccans drink it several times throughout the day and evening. Moroccans are famous for their hospitality, and it is Moroccan etiquette to offer tea to any visitors that might stop by. Although the tea is usually prepared with a generous amount of spearmint leaves, other herbs such as absinthium or wild mint might be used. At one time, mint tea was ceremoniously prepared in front of guests. This tradition still takes place at some formal occasions or as a matter of custom in some areas. During the tea ceremony, the host or hostess sits before a tray holding decorated glasses and two teapots. Fresh mint leaves (or other herbs), dried green tea leaves, sugar, and boiling water should be nearby. The host begins by rinsing the teapots with boiling water. He then adds the tea leaves to each pot and rinses the leaves with a little boiling water. The water is discarded. Sugar is added to the pots and the host fills them with boiling water. The tea steeps for several minutes before being stirred, and then the host fills the tea glasses halfway while pouring simultaneously from both pots. The pouring is usually done from a height of twelve inches or more. While the guests drink their first glass of tea, which is quite strong, the host will replenish the pots with more tea leaves and sugar. Large handfuls of fresh mint will also be added, and then the host again fills the pots with boiling water. It is this second pot of tea, fragrant with mint and usually heavily sweetened, that has gained fame both within and outside of Morocco. But the tea ceremony need not stop there. In Saharan tradition, a third pot is traditionally brewed while the second is enjoyed, making tea time a long, leisurely affair. These days, tea is much more likely to be prepared in the kitchen before being brought before the guests. 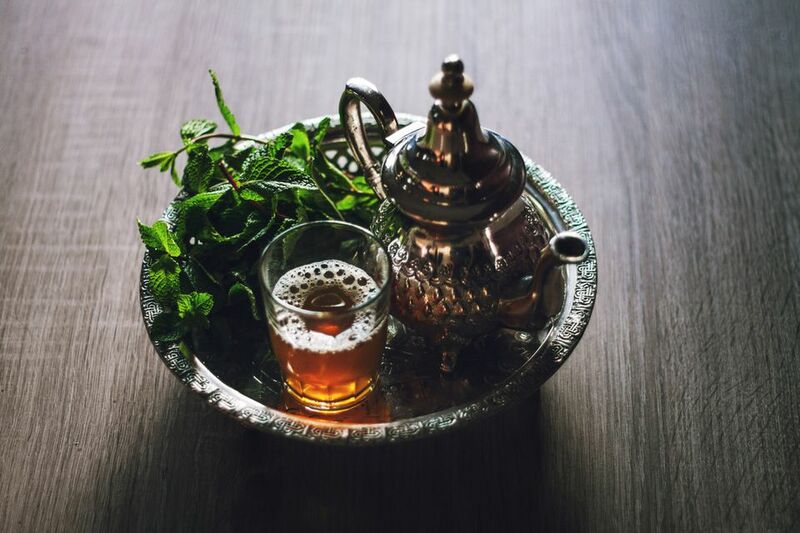 Nonetheless, if you've had the opportunity to have mint tea served by a Moroccan, you’ll probably agree that tea time can be quite impressive and is an ultimate way to relax with friends and family. If you’d like to try making it yourself, the photo tutorial will show the traditional steps involved in steeping your own pot of the sweet, flavorful tea.